Solid wood, turquoise colored. Slightly cambered body with extended corner strakes on a deeply lowered frame, ending over high curly legs in bronze caps. On the corresponding sides and in the front are extremely richly ornamented Baroque bronze fittings. Appropriately curved profile-framed cover plate. Openwork rocaille applications and cartridge-shaped fittings. 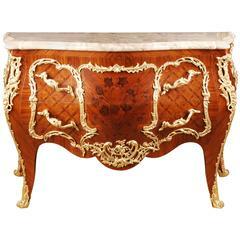 Solid beech wood, finely carved, colored and gilt gilded. Low foot and high headboard Quilted, curved backrest frame and open rocaille crowning. Everything is done by hand. 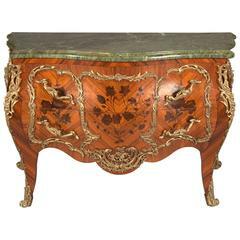 Italian painted Louis XV style serpentine shaped chest of drawers, circa 1910. Louis XV style painted bombe chest of drawers with bronze mounts and a marble top, circa 1900.